As I look toward the future, I’m excited by what I see: technology that has the potential to answer some of our biggest questions, solve some of our toughest challenges and help us better understand the world around us. We’re beginning to experience a world where everything computes, driven by technologies like the Internet of Things (IoT). Behind the scenes, in almost every industry, massive efforts are underway to connect our physical and digital worlds, unleashing what many are calling the Fourth Industrial Revolution. Technology provides us with the opportunity to be faster, smarter and better problem-solvers. For instance, sensors and big data can lead to insights and action in fighting against climate change, improving public safety, and strengthening health outcomes. Manufacturing firms are using industrial IoT to create factories of the future, building aircraft in virtual reality with robots and humans working side by side. The Fourth Industrial Revolution, like its predecessors, will no doubt bring enormous change to our daily lives, but in a positive way. The optimism demonstrated by young people in the World Economic Forum Global Shaper Survey is a testament to this. 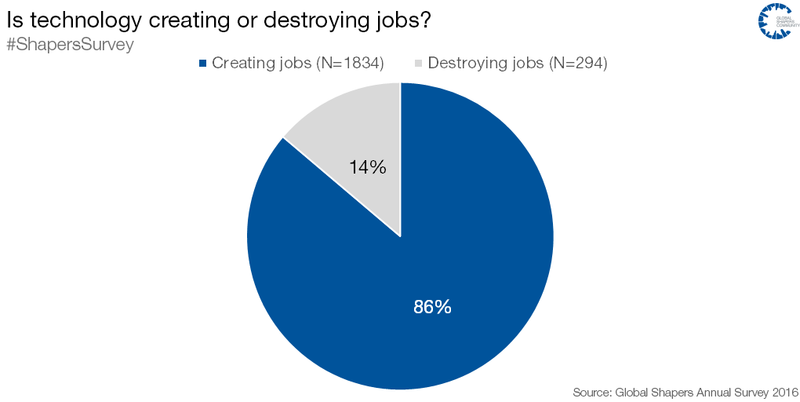 An overwhelming 86% of all respondents believe that although they expect technology to impact jobs, it is technology that will also create new jobs. History has shown that while these revolutionary technologies will ultimately bring greater opportunities to our world – improving the way we learn, work, communicate and govern – we must at first overcome major disruption. Take one of this year’s most buzzworthy topics: self-driving cars. The societal implications of this emerging technology are massive. From a jobs standpoint, professional drivers will give way to automation, just like manual factory jobs did decades ago. Cities will soon scramble to put the right infrastructure in place so that this innovation is safe for citizens and a benefit to our transportation systems. Governments will be forced to rethink their entire body of automotive regulations, as current policies will soon become irrelevant and IT infrastructures, which are already struggling to handle the data generated by billions of connected devices today, will have to brace themselves for even more. Today’s prototype self-driving cars produce about one gigabyte of data every second. 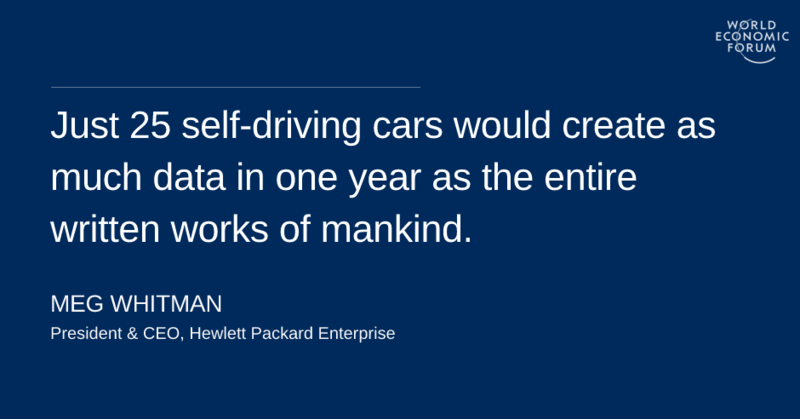 This means the average self-driving car would produce about two petabytes per year. Just 25 of these cars would create as much data in one year as the entire written works of mankind from the beginning of recorded history. Imagine when there are a millions of them? As a result, technology leaders are working quickly to develop completely new computing architectures to handle this ever-growing influx of data and its resulting demands on power and our scarce global energy resources. New ways of computing are just one example of how we’ll have to completely change our systems in order to tackle the challenges of this era. While these challenges are daunting, organizations that quickly adapt to our new reality will succeed, provided they have the right support across sectors. In education, 65% of children entering primary school today will ultimately end up working in completely new job types that don’t yet exist, according to a WEF report. Entirely new professions will open up. The Fourth Industrial Revolution will be classless, ageless and will affect people across different roles and backgrounds from manual work to well-established white-collar professions. It’s critical to transform both what and how we teach our children in school and encourage a life-long approach to learning, so that everyone has the right skill sets to be successful in the future workforce. More than ever, businesses across industries need to be agile. That means making strategic R&D investments, implementing new business models and putting the right people in leadership positions. A recent study revealed that companies at the forefront of technological innovation experience growth in productivity. And there’s no time like the present to invest in innovation – if you think the technology landscape is disruptive today, just wait 10 years. Last year showed us that there is a need for governments to listen to people’s concerns and expectations and provide a way forward. But government leaders can’t go it alone. By partnering with academic and industry experts, they can better understand emerging trends and implement the IoT-driven world their citizens expect, like public Wi-Fi, efficient transportation systems and lower energy use. In fact, in this new era, no single organization can go it alone. As a business leader, I’ve always stressed the importance of putting partnership first. You’ll succeed if you build a strong ecosystem of partners that allows you to focus on what your organization does best. We are just at the beginning of discovering what’s possible in the Fourth Industrial Revolution, and as global leaders, it’s our responsibility to steer the world through the challenges and opportunities ahead. It will take strong collaboration across the public and private sectors to leverage technology for the greater good, and ensure the Fourth Industrial Revolution puts people first. Leaders who come together across business, government and academia will learn new tools to help their stakeholders thrive and obtain more useful information and insight from the data to make better decisions. Technology is about opening doors to make new things possible. As the world becomes more connected, we must be proactive and open to new approaches that will help our fundamental institutions shape the way we use technology – not the other way around.